Carbonate rocks that once existed six kilometres below the surface of Mars points to ancient seas, while life's ingredients could also be formed in Titan's atmosphere, say two separate reports. A new study using data returned from NASA's Mars Reconnaissance Orbiter (MRO) reveals carbonate rocks – which on Earth form in oceans and lakes – within the uplifted central peak of an impact crater that lies to the southwest of a volcanic region called Syrtis Major. Prior to the impact that dug out the crater cavity, the central peak material originally lay deep below the planet's crust. Now exposed above the surface, studying the composition of the central peak material gives planetary scientists a glimpse back at ancient processes operating on Mars. 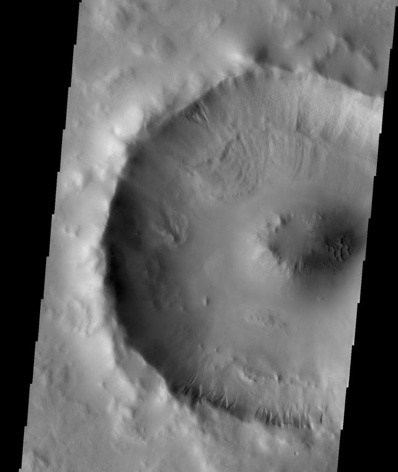 The central peaks of craters offer planetary geologists insight into the processes that occurred in a planet's history, exhuming material that originally lay at depth. Image: NASA/JPL/ASU. As well as carbonate materials, hydrated silicate minerals were identified in MRO's CRISM (Compact Reconnaissance Imaging Spectrometer for Mars) data, suggesting a hydrothermal origin, that is, it formed in the presence of heat and a liquid. Such as hydrothermal system likely existed with carbon dioxide deep within the crust, similar to environments that exist on the ocean floors on Earth. From deep within the Martian crust to Titan's upper atmosphere – last week a team of international scientists from American and France announced that amino acids and nucleotide bases, crucial ingredients for life as we know it, could be created using the chemicals present in Titan's atmosphere, and without liquid water. 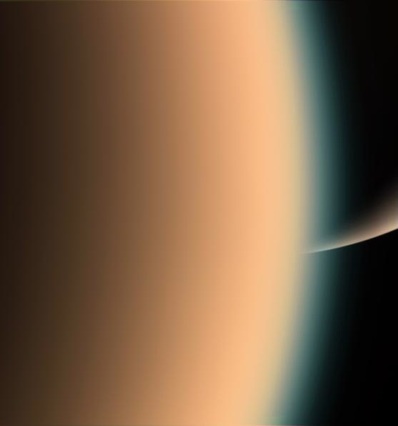 Could life's ingredients be created in the hazy outer atmosphere of Saturn's moon Titan? Hörst and her team think so. Image: NASA/JPL/Space Science Institute. Titan, moon of Saturn, is the only satellite to host a thick atmosphere, and one that may replicate conditions of early Earth. The finding that life's ingredients can by synthesized in Titan's atmosphere also has implications on the emergence of life on Earth – perhaps it rained down from the atmosphere instead of spring-boarding out of a liquid primordial soup. The team of scientists, led by the University of Arizona's Sarah Hörst, and her adviser Roger Yelle, performed laboratory experiments to learn about the composition of Titan's aerosols – tiny atmospheric particles that contain organic molecules. For that to happen, energy is needed to break apart the atmospheric nitrogen, methane and carbon monoxide to rearrange the fragments into more complex compounds such as prebiotic molecules. Conditions for that are too harsh at the moon's surface, but the upper atmosphere is exposed to a constant bombardment of ultraviolet radiation from the Sun and charged particles deflected by Saturn’s magnetic field, which could spark the required chemical reactions. A window into Titan’s atmosphere: in laboratory in France scientists simulated reactions occurring in Titan's atmosphere to produce many of life's ingredients. Image: S. Hörst. Hörst and her collaborators in France, mixed the gases found in Titan’s atmosphere in a reaction chamber, subjecting the mixture to microwaves to cause a gas discharge to simulate the energy hitting the outer fringes of the moon’s atmosphere. This caused some of the gaseous raw materials to bond together into solid matter, similar to the way UV sunlight creates haze on Titan. 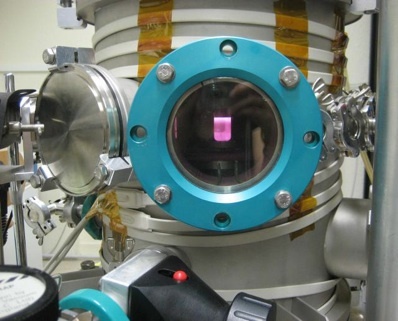 Analysing the aerosols that formed revealed around 5,000 different molecular formulas. Comparing them to all the molecular formulas for amino acids (the building blocks of proteins) and nucleotide bases (the elements of genetic code used by life on Earth) revealed striking similarities – Hörst identified more than half of the molecular formulas for the 22 amino acids that life uses to make proteins.